Dr. Aparna Kamat is the director of the Division of Gynecologic Oncology for Houston Methodist and is currently the section leader for the Gynecologic Oncology service line. After completing medical training in India, Dr. Kamat completed her residency in OB/GYN at West Virginia University where she served as chief resident. She completed her fellowship training in Gynecologic Oncology at the MD Anderson Cancer Center. During her fellowship, she received multiple awards for her research in ovarian cancer and endometrial cancer including the Virginia K. Pierce award and the Asche Murray fellowship. She also received the prestigious BIRCWH award from the N.I.H. for her research in biomarkers for ovarian cancer. 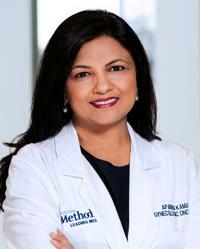 Dr. Kamat currently is the principle investigator for the Gynecologic Oncology Group Clinical Trials Program at Houston Methodist and offers several state-of-the-art clinical trials for patients with gynecologic malignancies. Her areas of expertise are robotic and minimally invasive surgical options for women with gynecologic cancers and complex pelvic disease. Her other clinical interests include hereditary risk assessment and treatment of gynecologic malignancies. The goal of Dr. Kamat's practice is to provide individualized and advanced treatments for women with gynecologic cancers in a personalized and compassionate manner.